Duck wants to join a club. But he needs to be able to ROAR to join Lion Club, or TRUMPET to join Elephant Club. And all he can do is QUACK! What's a Duck to do? Why, set up his own club of course... where everyone is welcome to join! I found it childish. I recommend it for less than ten years old. This book is very funny. I loved the drawings in the book- the lion carrying dumble, the snake wearing goggles! The lion even didn't eat the duck! The best part of the story was that the duck wanted to make friends. I feel funny when the duck tries to make the sounds of the other animals. No one lets him join their club. So he makes his own club. 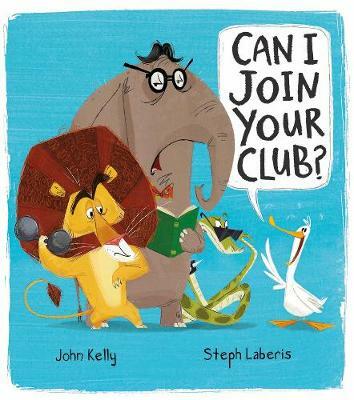 He lets tortoise, rabbits, bird, boar, Ostrich, snake, elephant and lion into his club. This is very nice. We should not be selfish. We should be just like the duck. Not the way he quacks or flys. But his behaviour. The duck wanted to join a club however the people don't allow him to join so then he decides to become independent and makes his own club and being kind he allows everybody in the club and made his dream come true by having all those friends. I like the book because the pictures are very expressive and it has a moral to it which id don't leave people out of things. AND IF SOMEONE DOES THEN GET BACK RIGHT UP AGAIN! I liked it cos they kept saying Can I join your club and they kept saying no. My favourite ones were the lion and the snake. This book is really enjoyable for little kids I read it to my 1 year old brother andhe really enjoyed it . I like this book because the duck made a club that everyone can join.